Built by our in-house guild shop, Belden Cable Assemblies by HAVEPro offer the quality and reliability that only come from hand-assembled cables. We combine the proven excellence of Belden cable with leading brand connectors like Neutrik and Canare to give you the best of the best! Each and every one of these premium video cables is created and tested individually, ensuring perfect signal paths and long dependable life. That's not just something we say, either: all our HAVEPro cable assemblies are fully backed by our HAVEPro Lifetime Warranty! 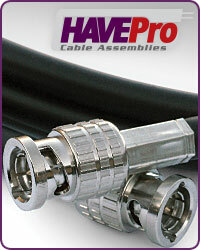 Because we build these Belden Cable Assemblies by HAVEPro right here, we can custom tailor any assembly to suit your needs. If there's a cable you need that you don't see here in our store, just send us an e-mail or call us at (888) 999-4283 and we'll get it for you!